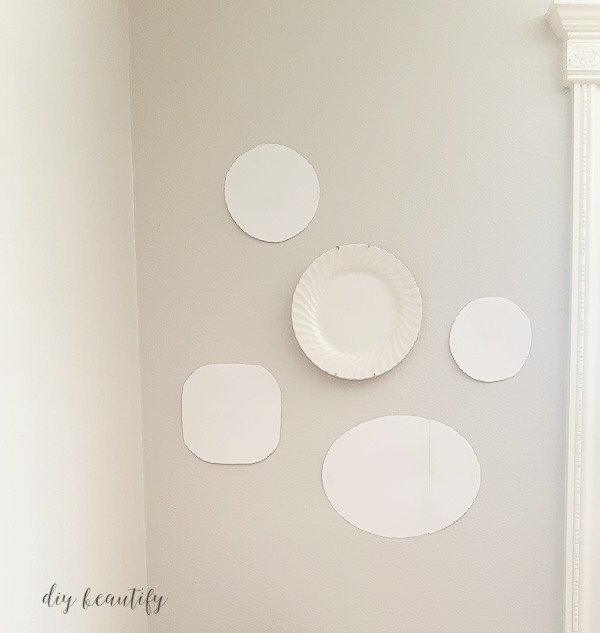 You will love this easy DIY method to hang plates on the wall! Friends, this might be one of my favorite low-cost projects! 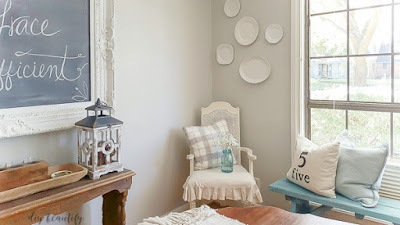 It takes just minutes to hang plates on the wall and it's basically free if you have just a few simple supplies! Affiliate links included for your convenience; my full disclosure policy can be found here. The dining room in our new home is (mostly) finished! I have a tendency to go overboard with the decorating, and wanted to keep this space as simple as possible...while still being cute and cozy. I just finished a really sweet burlap table runner with pom poms and trim, perfect for spring. I have a large window in this room with beautiful molding that I didn't want to cover up. However, the spot on the side needed a little something-something! I've amassed a large collection of white ironstone over the years, mostly from thrift stores. And while it does get used, it spends most of its life sitting in my black hutch. I decided to get a few of my favorite pieces out of hiding and hang them on the walls! I had several plate hangers, but didn't care for the way the little gold feet showed on every single plate. 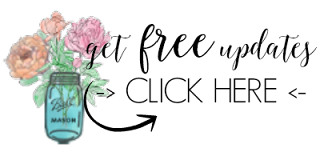 While searching for an affordable alternative, I found this tutorial from The Frugal Homemaker. Did you know you can make DIY plate hangers from simple paper clips? This was too good not to share! I rounded up my supplies and did just that and I'll share the tutorial, with my twist, below. I do want to mention that none of these plates are family heirlooms. Of course I'd be sad if any of them fell of the wall and broke (thankfully that hasn't happened)...but please use regular plate hangers for your heirloom, priceless china! Just in case! These plate hangers are what I've used, and I've heard good things about the discs too! Decide what plates you want to use. I'm a visual person and needed to know exactly how the plates would look hanging on the wall. Obviously I could only hold up 2 plates at a time. I needed another way. My solution was to make paper templates of the plates. I traced around each one, cut it out and taped it to the wall with my low-adhesive frog tape. This way I was easily able to adjust placement. I already had a nail in the wall, so hung one of the larger plates on that and worked around that center point. Next, I cut out small circles of felt to fit the center of the plate backs. Untwist the paperclip so you have a large hanging hook and the bottom loop. This larger loop is what will get glued to your plates. NOTE: use the jumbo paperclips for large plates; regular size paperclips are fine for small plates. Because the E-6000 takes awhile to dry, I used hot glue on top of the paperclip as well as to quickly hold the paper clip down and to secure the felt to the back of the plate. The felt holds everything together and looks nicer! I hammered in a nail on each of the paper templates so that my plates went right where I wanted them, then I simply tore the paper away from the nail and hung the plates! 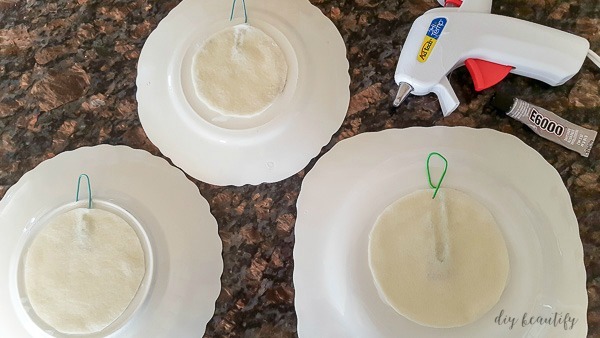 Before hanging your plates you need to allow time for the glue to dry. I set heavy objects on the back of each plate to help the glue to really set well before I attempted to hang. I know you'll be impatient, just like I was...but give it an hour or two to really set! You'll see that I used the regular plate hangers on my two larger plates...to be safe! I love how it turned out! This little corner is so pretty now. What do you think? 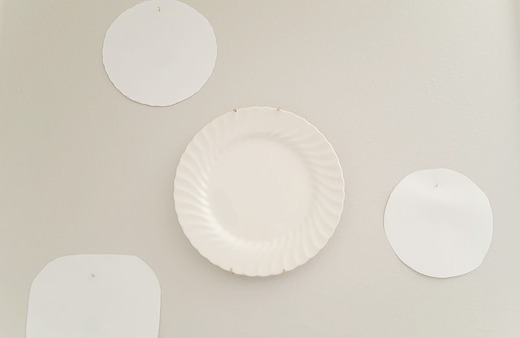 Would you try this method of hanging plates on the wall to save money? It was nice to take a small break from my laundry room makeover! 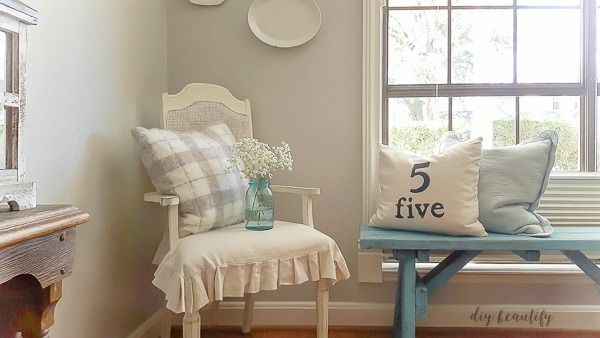 I created a completely new space, full of simple farmhouse charm, for only $100! If you want to check out my progress so far, head here. I'll be sharing the full reveal next week!